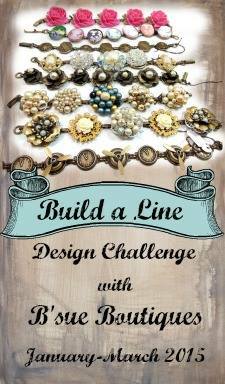 I will be participating in a Jewelry Build a Line From B’Sue Boutiques. I will be posting in January 2015 what my work will be, scanning in my sketches and what I will be submitting for the challenge. Currently I am sketching out ideas and playing with the supplies I have to work with. I will also determine what else I need to purchase for the challenge. I have two emotions, excitement and nervousness all at the same time! I will be letting you know my thoughts and feelings about this as I go. I cannot reveal exactly what I am designing until January 2015 but I will be letting you know how I am maturing while I go through this process!